Canoeing and kayaking are both great fun, and as long as you have great respect for the forces of nature and are aware of the dangers involved, you can stay out of trouble(and hopefully the water too) and keep yourself safe. Here are a few tips for keeping dry and staying out of trouble. Put on your lifejacket; don't go on or near the water without one. Plan ahead for your journey, know what hazards you are going to come across and plan accordingly. Don't try and tackle a route that may be too difficult for you or other members of your party.Check your craft to make sure it is in good condition, and check the local weather forecast in case bad weather is expected. Don't boat on your own. The recommended number is three people with a minimum of two boats. Have a safety plan that everyone in the group is aware of, make sure they know their responsibilities to themselves and other group members. Be suitable equipped with appropriate clothing and equipment for the trip. Spare clothing (in a waterproof container in case you capsize), plenty of food and water, map, first aid kit, tape, knives, sun block and hat in hot weather, a rescue line and spare paddle and anything else you may think you need for your trip should be placed in a waterproof bag and tied securely to one of the centre beams in the boat.This way if you capsize you're equipment and clothing won't be lost. If you wear glasses, or are wearing sunglasses remember to secure them before you get into the boat. If the weather is bad-don't go out! Get someone to hold the boat steady. You don't want to get wet before you even set off. Bend your knees and crouch down low while grabbing the sides of the canoe for balance. Walk along the centre of the boat to your seat this will stop the boat from rocking. 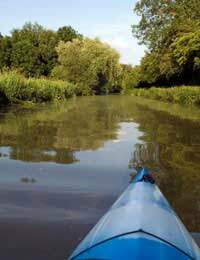 Avoid standing up or walking in your canoe when you are any distance from the shore. Don't make any sudden or jerky movements that could rock the boat and cause it to tip over. Steer a course well away from any overhanging branches or trees, or any other obstacles near the shore. Be aware of the currents at all times. If they begin to pull you further down river than you expected, or they are faster than you anticipated and you feel out of control, head for shore immediately. Try and keep the canoe at right angles to the waves at all times, if you don't you run the risk of being turned over.Keep a safe distance between you and other boats. Let any other boat clear a hazard before you tackle it. Don't panic! Try to stay with your canoe if possible. Get to the upstream end of the boat and hold on, this will avoid you being crushed against any rocks. Your canoe will float even if it's full of water, so paddle or push it towards shore. Once you are in shallow water you can turn over your boat empty it and climb back in. So grab your paddle and lifejacket and take note of these tips and you'll have plenty of fun and safe canoeing on the water.